You don’t have to be macho to be male. Dhiira ta’uuf qama cimina dhiirummaa qabaachuun sirra hinjiru. Kutaa har’aa keessatti waa’ee barsiisota dhiiraa mana barnootaa sadarkaa tokkoffaa mari’anna. According to The Organisation for Co-operation and Development, in which of the following countries are primary school teachers almost 50% male? Yooyyaa! Gara English Together kan mata duree tibbanaa irratti mari’annuufi qooqa ittiin dubbachuuf si barbaachisu siif qoodnutti baga nagaan dhufte. Ani Caaliidha. Akkasumas Saamiifi Fiil nagaa isin gaafatu. Sagantaa har’aa keessatti, barsiisota dhiiraa mana barnootaa sadarkaa tokkoffaa Landonitti argamu keessa jiraniifi ijoolee umurii waggaa shanii gad barsiisuurratti boba’an keessa %2 qofti dhiira ta’anii ilaalla. Kun waa’ee barsiisotaa sadarkaa tokkoffaa addunyaarra jiran akka yaannu nu taasise. Gaafiin keenya har’aa, The Organisation for Co-operation and Development – irraa fudhatame kun: biyyoota kanneen keessaa kamtu manneen barnootaa sadarkaa tokkoffaa keessatti tilmaamaan barsiisota dhiiraa hanga %50 qaba? Yes, we’ll give you the answer later in the programme. Amma, gaaf-deebii BBC World Service barsiisaa dhiiraa mana barnootaa sadarkaa tokkoffaa waliin taasise haacaqasnu. The thing about a lot of men is, yeah, a lot of them haven’t tapped into that side of their personality yet. But, I think that, what will draw people to the profession is if they had more knowledge about the profession. They will understand that, uhm, they will get to see the benefits that it will have having a balanced workforce, you know… It breaks down the whole ‘you have to be macho to be a male’ thing, you know. Basically, we’re positive role-models for them, you know, and we show them a whole different side of this ‘being a male’ thing. Eeyee, barsisonni gara barsiisummaa sadarkaa tokkoffaatti dhufuuf sadarkaa jalqabaarraati ‘in the first place’ wayita yaadan maaltu akka fedha isaan dhabsiisu ‘puts them off’ irratti gaafiiwwan gaazexeessa wayita deebise. Knowing that it involves working with children is enough to put me off! ‘To tap into something’ jechuun waan qaban tokko hubatanii hojiirra oolchuu yaalu. Yes, I have seen you tap into those sides of your personality here in the studio sometimes, Phil. ‘To draw someone to something’ jechuun namni tokko gara waan tokkootti fehdii akka godhatu taasisuu ykn hawwachuu. Maybe some people don’t respect primary school teachers because the ‘perception’ is ‘hubannoon jiru’ they spend all day playing with children? But they do a lot more than that. Like the teacher was saying earlier – having more male primary school teachers would help break down these incorrect perceptions. Maybe, yes. ‘To break something down’ jechuun waantokkof falla furmaata itti kennuu. And some countries have obviously been successful in breaking these ideas down. I’m curious – what was the answer to the quiz you asked us earlier? Tole, gaafiin armaan dura si gaafadhe - Biyyoota kanneen keessaa kamtu manneen barnootaa sadarkaa tokkoffaa keessatti tilmaamaan barsiisota dhiiraa hanga %50 qabaa? kan jedhu ture. Deebiin sirriin c) Sa’udi Arabiyaadha. Egaa torban kanaaf nagaa otoo sitti hindhaamiin dura, jechoota har’a irratti dubbachaa turre haa’ilaallu – hundisaanii ‘phrasal verbs’, gochawwan jechoota tokkoo olirraa uumamaniidha: ‘to put someone off from doing something’ nama tokko waantokko hojjachuurraa fedhii dhabsiisuu, ‘to tap into something’ waan qaban tokko hubatanii hojiirra oolchuu, ‘to draw someone to’ nama tokko gara waan tokkootti fehdii akka godhatu taasisuu ykn hawwachuu, akkasumas ‘to break something down’ waantokkof falla furmaata itti kennu. Turtii waliin qabaanneef galatoomi; barnoota dabalataa English Together n torban ittaanu walitti deebina. If someone or something puts you off from doing something, it means that you are discouraged from doing it. We often use this phrase to talk about something unpleasant that makes us not want to do something. My bad experience with my manager has really put me off working in retail. Knowing that teaching involves working with children is enough to put me off! After eating fish on holiday I was very ill. I've been put off seafood ever since. When you tap into something, you manage to use something in a way that brings you positive results. Working with children has really helped me tap into my creativity. If we could tap into that kind of energy, we're sure to win the championship. You have sides of your personality that are fun and playful. You just need to tap into them! If someone is drawn to something, it means they are attracted to it. We often use this phrase to talk about the reasons why we do something. Some people think we need to draw more people to primary school teaching. I think he was always drawn to travelling – he loves new experiences. When you break something down, you challenge it or show it to be wrong. We often use it to talk about prejudices and stereotypes that we think are unfair. Having more male primary school teachers would help break down these negative perceptions. We need to break down the idea that people are more important just because they have a lot of money. It breaks down the whole 'you have to be macho to be a male' thing. My brother came back from the cinema and told me terrible things about the film he saw. He was really trying to _____ _____ _____ from seeing it. Gamakee hinbeekamne akka beekamuuf gochuu. Susie is a doctor and she is also in a wheelchair. She has often had to _____ _____ the idea that disabled people can’t work. 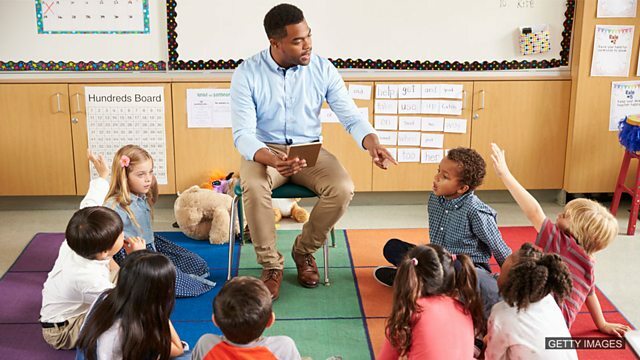 What do people in your country think about the role of a primary school teacher? Are there many male teachers where you live? Would you like to be a teacher? Tell us on our Facebook group.